Office space prices ranging from ¥1500 - ¥2750 per month. The centre is in the "Nanjing Chenguang 1865 Creative Industrial Park". The building is a historic building. It is surrounded by historical building and the mother river in Qinhuai River-Nanjing is in the North. The Zhonghua Gate Station of the Southeast Metro Line 1 is connected to the famous Yuhuatai Scenic Area. The centre provides 24 hour security, CCTV, administrative support, central heating, copy and print facilities, meeting room, onsite management team and free Wifi for your daily office use. This location attracts many multinational corporations including IBM, Citibank and more. Easy to access, this is a prestigious venue for your business. Standing in the heart of the citys lively Xin Jie Kou district, this centre offers a range of offices to suit your needs. This centre has excellent connections to other districts, and is close to many famous attractions. The centre offers Grade A offices, and the building is also home to restaurants, a 5-star hotel and other amenities. This centre is part of the latest city development zone, Najing Central Technology Park and is surrounded by a whole host of local amenities including hotels, fitness clubs, an art museum and various banks and financial services. In the heart of Nanjing this centre benefits from an easy to reach location with great access to local transport links. Beautiful views of the Hexi Central Park can be had from the serviced office space, executive suites, hot-desking options and business lounges. The centre is in Gulou District, Nanjing. It is 10 minutes from the Meadow Gate Station of Metro Line 4 and 8 minutes from the bus station. The surrounding area is the quiet. It is surrounded by Hehai University and Nanjing Academy of Arts. The centre provides 24 hour security, CCTV, parking service, central heating, meeting room, reception services and copy and printing facilities for your daily office use. With stunning views from the 22nd floor, this business centre is located in an iconic downtown Nanjing office tower. Meeting rooms and conference facilities complement fully furnished executive office suites, private offices and shared office solutions. Situated within a skyscraper tower as part of a mixed-use development, this impressive office space offers clients a wide range of facilities and services as well as flexible terms, all within a strategic, central business district address. 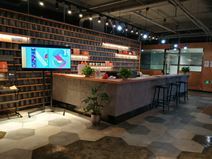 The space is within close proximity to a range of local amenities, including hotels, bars and restaurants, and sits close to Nanjing's Lukou Airport and public transport. The centre is located in the Zhujiang Road Business Circle in Nanjing and It is the first-class gathering area in Nanjing. The centre is surrounded by many office buildings around and the business atmosphere is strong. The location is excellent and the traffic is very convenient. The centre provides a gym room, coffee bar, book bar, multi-purpose hall, open road show area, meeting rooms and other supporting facilities. The centre is located in the intersection of Zhujiang Road and Danfeng Street and there are 2 subway lines. The location is excellent and the traffic is very convenient. The transportation is is 300 meters from Zhujiang Road Station on Line 1 and 900 meters from Floating Bridge Station on Line 3.It is a first-class crowd-building area in Nanjing as well. The surrounding office buildings are full of business environment. The centre provide 24 hour access, CCTV, meeting room, parking and WIFI for your daily uses.